Regardless of the fact that the pick up line is already a lame attempt at getting your number, it is even more laughable when considering that only foodies would even understand it. Those who are health-conscious, interested in nutrition or straight-up foodies will know the significance behind the completeness of quinoa. Considered by many to be an ultimate health food, quinoa is a complete protein, meaning that is contains an adequate proportion of the nine essential amino acids. Even more impressive, the crop is rich in dietary fiber, with about 7 grams of fiber per every 100 grams of quinoa, iron, magnesium and calcium. With so much nutritional value, quinoa is a well-rounded substitute for rice, cous-cous, pasta and even oats. Like these grains, quinoa is a versatile ingredient that can be combined to create sweet and savory dishes, including granola, salads and morning bowls. 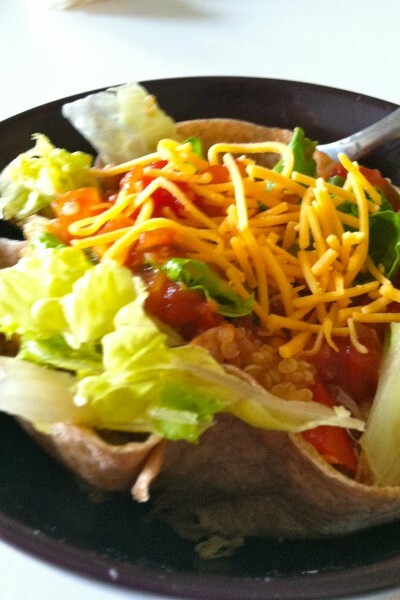 For this recipe, quinoa takes the place of rice as the base for a healthful taco salad. When it is mixed with any range of toppings and piled in a healthful alternative to the deep-fried version of a tortilla bowl, you have a Mexican meal in a minutes that is nothing short of complete. In a medium-sized saucepan, bring water to a boil. Rinse quinoa and set aside. While waiting for the water, prepare tortilla bowl. Take a small bowl (such as one for your morning cereal) and place tortilla inside. Spray with vegetable spray. Microwave on high for 60-90 seconds (this will depend on the strength of your microwave; check after one minute for desired crispiness, then zap for another 30 seconds if necessary). Remove from microwave and repeat with second tortilla. When water comes to a boil, add the rinsed quinoa. Add half of a package of taco seasoning, then garlic powder, and salt and pepper to taste. Stir to combine. Reduce heat to a simmer and cook according to package directions (typically 10-15 minutes or until water is fully absorbed into the grain). Once finished, turn off the heat and distribute the quinoa between the tortilla bowls. Finish with desired toppings, such as cheese, salsa and chopped vegetables.